Make the world a happier place one person at a time with a Gift Certificate from TheSurfNetwork.com. Choose from either a printable version that can be printed on your own printer and delivered to the recipient in person or choose the email version that can be delivered to the recipient's in-box immediately via email. Available in amounts from $10.00 to $100.00 the Gift Certificates never expire and can be redeemed world wide. In a rush? 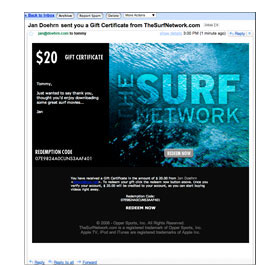 Print a Gift Certificate from TheSurfNetwork.com on your own printer and deliver it to the lucky recipient in person. 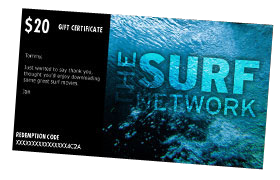 Surprise a friend or family member with a Gift Certificate from TheSurfnetwork.com in their in-box by sending them a Gift Certificate immediately via email. If you want to put more thought into giving than sending a simple Gift Certificate, give a product specific gift instead. This allows you to personally pick a movie, episode or complete season that you think will be appreciated by the lucky recipient. You also have the option to deliver the gift via email or printing on your own printer. A Premium Gift Membership is the perfect gift for anyone who likes watching surf videos. 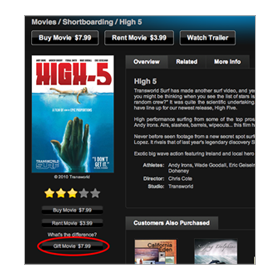 With a Premium Membership they can watch any of over 800 surf movies, videos, TV shows and more instantly using Watch Now for free.